A handy reminder of the real issue. Spotted on Bella Caledonia. The article that inspired the graphic reveals that out-and-out tax fraud (as opposed to tax avoidance) runs £5bn a year, four times larger than benefit fraud at £1.2bn a year. I'm equally concerned about the legal but immoral underpayment of tax by the like of Amazon, Google, and Starbucks. I want the government to focus on tax fraud and sorting out a fairer tax code as its first priority. The article also notes that if welfare fraud and welfare underpayment due to error were both eliminated at the same time, then welfare bills would increase not decrease. 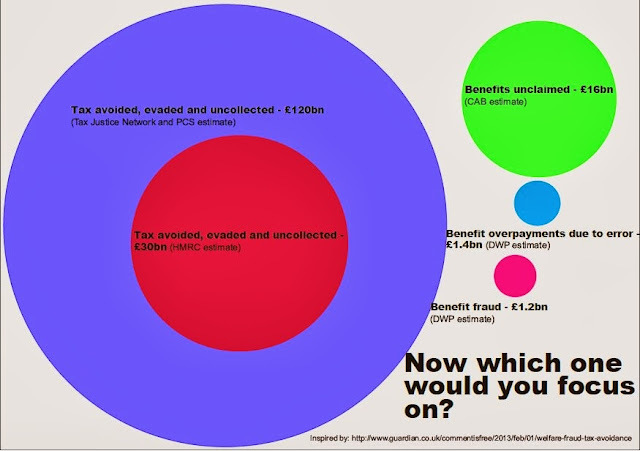 Surveys show people believe fraud amounts to 27% of the welfare bill, while accounts show the actual amount is 0.7%.